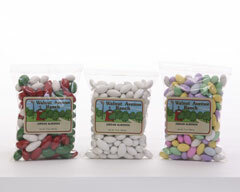 Always popular and equally delicious, candied almonds are an irresistable treat. Chocolate, Yogurt and Butter Toffee coatings on crisp healthful almonds are always in season and are sure to satisfy your cravings. Easy to serve, hard for your guests to resist. Soft, dried Cherries, Blueberries, Apples, Apricots, and Cranberries are enrobed in milk and white chocolate and colorful coatings. Supreme raw almonds, candy coated. A favorite for entertaining and gift-giving. OUT OF STOCK ON CHRISTMAS JORDANS. 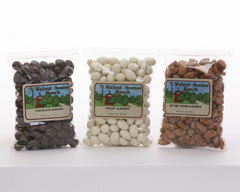 Our exclusive recipes for our crunchy, premium nut brittles include a generous amount of butter and various nuts. We cook the brittle in copper kettles, then hand-pull it, while hot, to the proper thickness. 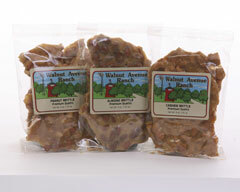 The almond, peanut and cashew brittle we offer here are long-time favorites and best-sellers.